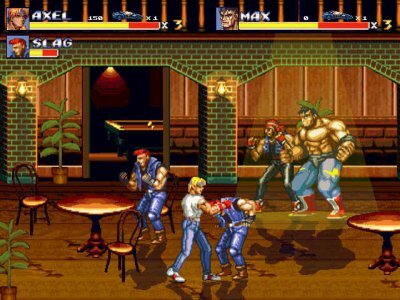 Streets of Rage 2 is superior in almost every way to the original, and is observed by some (me included) to be the very best example of a scrolling beat-em-up ever made. The graphics are beefier, with bigger sprites, the music is amazing, and the presentation is top notch. All enemies have energy bars now which is a welcome addition. Basically it is a year after the events of the first game, the City has turned peaceful when suddenly Mr. Big (now called Mr. X) who was believed dead re-appears with an army of thugs and takes control over the City again. Adam one of the playable characters of the first game is kidnapped. So this time 4 characters set out to rescue Adam and defeat Mr. X again. Blaze the fast but weak woman and Axel the average reappear, as well as new characters Skate (really fast, but really weak), and Max (really slow, but really strong). There are again 8 levels to fight through. From the Streets all the way to Mr. X's jungle hideout. The levels are a lot bigger and varied than before. 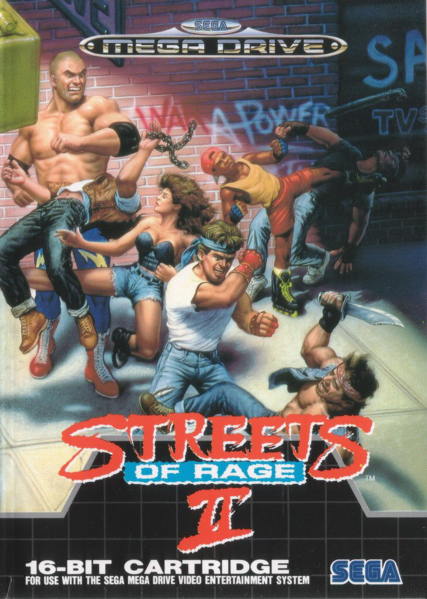 Where in Streets of Rage you just fought from left to right in a straight line, here the levels are split into smaller sections taking place in different locations, and also make more use of lifts, and diagonal routes. A good example of this is level 3. As well as several street areas there is an arcade you fight through, a Pirate themed park, and a really atmospheric Alien themed land (complete with mid-level Alien boss, and exploding Pods). Gone are the smart bombs, and to replace them each character has unique special moves. These special moves are powerful, and can be used at any time, but use up energy quite a bit, so need to be used strategically. There are many many more moves per character, far more than the limited 5 or 6 of the original, though the useless co-op moves have vanished. The enemies are amazing. A lot of the enemies are updated ones from the first game. The fat man boss has been relegated to a normal enemy, and is now throwable, the ninjas are much more deadly now, the prostitutes now have electric whips, and a host of bikers have joined the fray. There are a lot more mini-bosses now which turn up throughout the levels. The bosses are really cool. There is a Blanka rip-off, a flying man, and even robots as bosses. Only once does a boss repeat itself. The first boss in particular is fab. You’re fighting in a club. At the end of the level you get to a bar. Barbon the Bartender is cleaning glasses behind the bar. When he sees you he leaves exit stage Right. The next section of the level takes place in an alley way behind the club. Rain is lashing down. Barbon and his stooges are in fighting positions waiting for your approach. As you draw near Barbon yells “come on!” before ripping his shirt off. A classic moment in a classic game.